I think in one of my posts I mentioned I had a few WIP's, well she was one of them. I finally finished her. 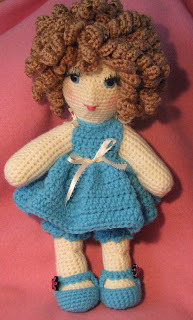 Her name is Cherise, she is a crocheted 14" doll with thread jointed arms and legs. I really like the thread jointing - gives her arms and legs mobility and the ability to pose. I will be posting the pattern in my Etsy and Artfire stores and will also be available in Ravelry in the next couple of days. I tried several new techniques with this doll, and it all pulled together really well. I also designed and made some new jewelry too. I will post those pics later. Your doll is beautiful. I believe I could just sit and talk to her. She looks very real, great job. 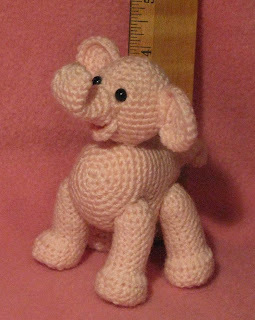 Ohh she is sweet and love the elly too :-) It will be fun to see all the different girls that pop up with your pattern. I love that little Elephant! I'd love to make one, too, do you have the pattern? Thank you, I am finalizing the pattern. Will post details soon. Sooo sweet doll! Like your blogg!